Fired FBI Director James Comey, still unhinged over President Donald Trump’s meeting Monday with Russian President Vladimir Putin in Finland, called on voters to give control of Congress to the Democrats, claiming that the GOP-led Congress has failed in its constitutional role role and cited “History”. Unstated by the Trump-hating Comey is that a Democrat Congress would be more inclined to impeach and remove Trump from office. The quote cited by Comey is by James Madison. Fox News’ Chad Pergram wrote about it in 2012 during the battle between the GOP-controlled House and Democrat Attorney General Eric Holder, which ended with Holder being held in contempt of Congress. “Ambition must be made to counteract ambition,” wrote James Madison in Federalist Paper #51. He wrote that “each department should have a will of its own: and consequently should be so constituted that the members of each should have as little agency as possible in the appointment of the members of the others.” Madison believed that subdividing power in this manner created what he called a “double security” to protect the people. But Madison was clear that he believed the legislative branch should be the most-powerful area of government. It was ultimately the voice of the people. End excerpt. Read entire Chad Pergram article at this link. 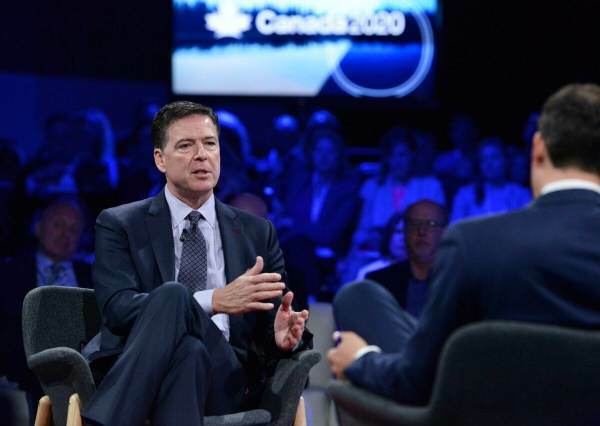 Comey, a former life-long Republican, told Congress in 2016 he was no longer a registered Republican.